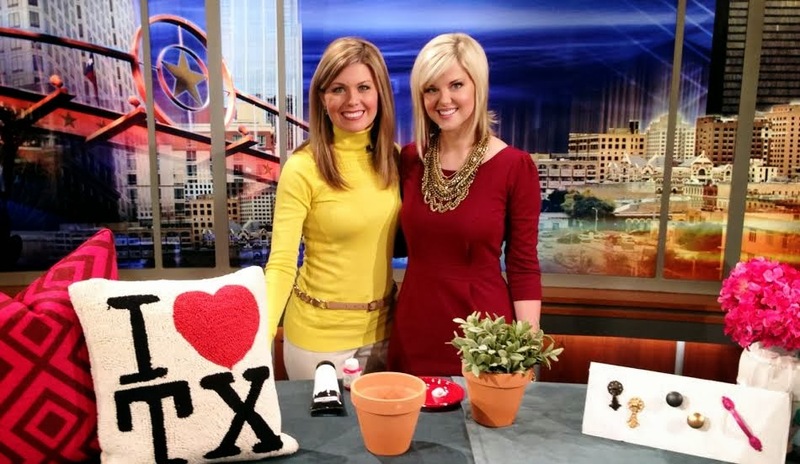 Good Day Austin: Spruce Up Your Home for Spring! I’ll admit that packing away all of the tinsel and twinkle lights put me in somewhat of a post-holiday slump. To cheer myself up, I made some simple updates around the house to give it a fresh look for the new year. Little changes, like re-styling a bookshelf or coffee table or refurbishing items you already have can make a big difference in your home–and your mood! This morning on Good Day Austin, I shared some super easy ideas on how to spruce up your home for spring. Obviously, there was a lot of spray paint involved. Read below for project ideas and some helpful spray painting tips. Update old items you have lying around the house (i.e. water pitcher, less-than-cute lamp) with some spray paint, and they’ll look as good as new-to-you! Voila! Take old or mismatched serving pieces or silverware and paint the stems to give them a fresh, modern look. Fancy up your potted plants by adding some fun details to those plain ol’ terracotta pots. As mentioned in the segment, this is a great project for kids to get involved with too. Make sure the items you’re painting are CLEAN. Remove all rust, dirt, dust, etc. When painting multiple coats, paint the second within 10-15minutes OR wait a full hour to let the first coat completely dry. When the first coat is still ‘tacky’ to the touch, you’ll have a hard time getting that smooth finish with the second or third coats. When painting larger pieces, let them dry for a few hours before you move them, otherwise you can risk smudges or finger prints. Smaller pieces, like cabinet hardware, are normally fine after an hour or so. Remember, when painting in colder temperatures, like right now, paint takes longer to dry. Be patient! If you find drips or smudges after the paint dries, simply use a fine grain sand paper to sand it down, dust, and then just apply another coat.